This is a great battery-backed real time clock (RTC) that allows your microcontroller project to keep track of time even if it is reprogrammed, or if the power is lost. Perfect for datalogging, clock-building, time stamping, timers and alarms, etc. 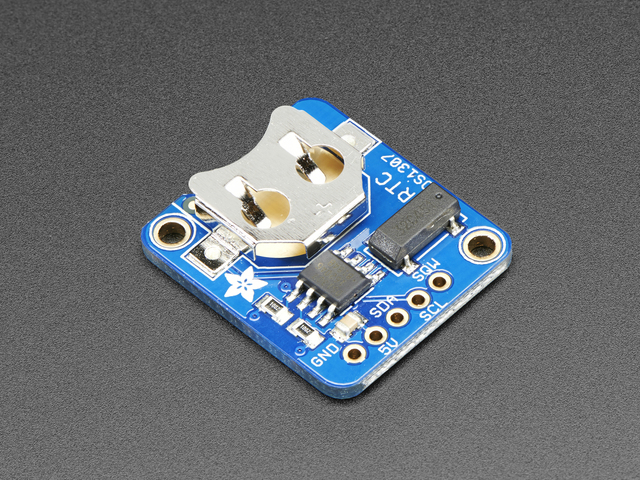 The DS1307 is the most popular RTC, and works best with 5V-based chips such as the Arduino. This breakout board is a kit and requires some light soldering which should only take about 15 minutes. A real time clock is basically just like a watch - it runs on a battery and keeps time for you even when there is a power outage! Using an RTC, you can keep track of long timelines, even if you reprogram your microcontroller or disconnect it from USB or a power plug. Most microcontrollers, including the Arduino, have a built-in timekeeper called millis() and there are also timers built into the chip that can keep track of longer time periods like minutes or days. So why would you want to have a separate RTC chip? Well, the biggest reason is that millis() only keeps track of time since the Arduino was last powered - . That means that when the power is turned on, the millisecond timer is set back to 0. The Arduino doesn't know that it's 'Tuesday' or 'March 8th', all it can tell is 'It's been 14,000 milliseconds since I was last turned on'. The image above shows a computer motherboard with a Real Time Clock called the DS1387. There's a lithium battery in there which is why it's so big. The RTC we'll be using is the DS1307. It's low cost, easy to solder, and can run for years on a very small coin cell. As long as it has a coin cell to run it, the RTC will merrily tick along for a long time, even when the Arduino loses power, or is reprogrammed. 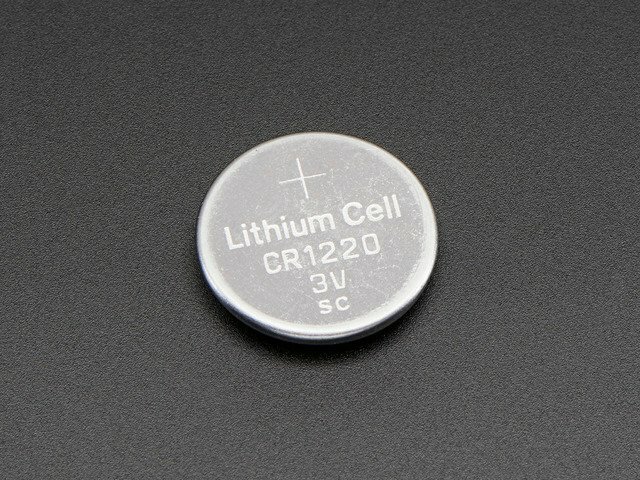 You MUST have a coin cell installed for the RTC to work, if there is no coin cell, you should pull the battery pin low. If you have the assembled version, skip this step, it's done for you! Place the circuit board in a vise so that you can easily work on it. Begin by soldering a small bump onto the negative pad of the battery: this will make better contact! Place the two 2.2K resistors, and the ceramic capacitor. They are symmetric so no need to worry about direction. If you're planning on using with a Raspberry Pi (which has 3.3V logic and built in pull-ups, skip the 2.2K resistors! Then place the crystal (also symmetric), the battery holder (goes on so that the battery can slip in the side) and the RTC chip. The RTC chip must be placed so that the notch/dot on the end match the silkscreen. Look at the photo on the left, the notch is pointing down. Double check this before soldering in the chip because its quite hard to undo! To keep the battery holder from falling out, you may want to 'tack' solder it from the top. Then flip over the board and solder all the pins. 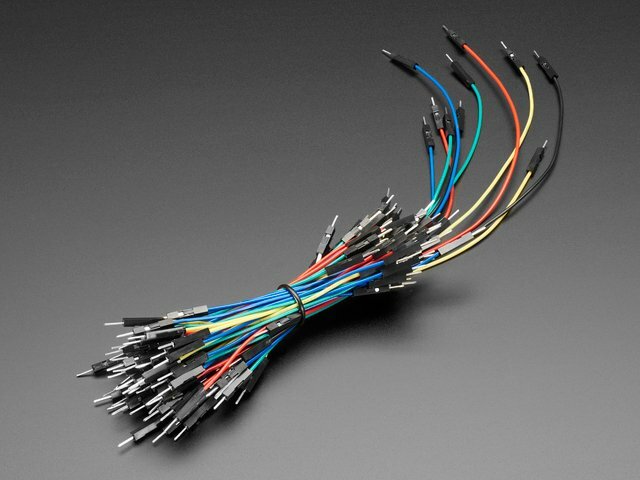 Clip the leads of the resistors, crystal and capacitor short. If you'd like to use the header to plug the breakout board into something, place the header in a breadboard, long side down and place the board so that the short pins stick thru the pads. Insert the battery so that the flat + side is UP. The battery will last for many years, 5 or more, so no need to ever remove or replace it. 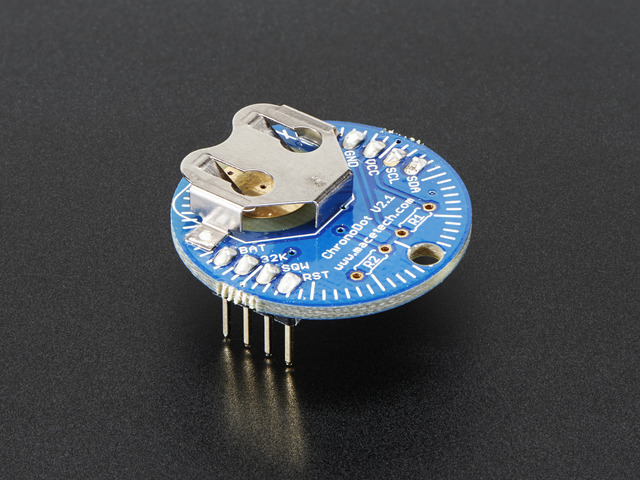 You MUST have a coin cell installed for the RTC to work, if there is no coin cell, it will act strangly and possibly hang the Arduino so ALWAYS make SURE there's a battery installed, even if its a dead battery. There are only 5 pins: 5V GND SCL SDA SQW. 5V is used to power to the RTC chip when you want to query it for the time. If there is no 5V signal, the chip goes to sleep using the coin cell for backup. If you set analog pin A3 to an OUTPUT and HIGH and A2 to an OUTPUT and LOW you can power the RTC directly from the pins! Connect Arduino UNO A4 to SDA. Connect Arduino analog pin A5 to SCL. 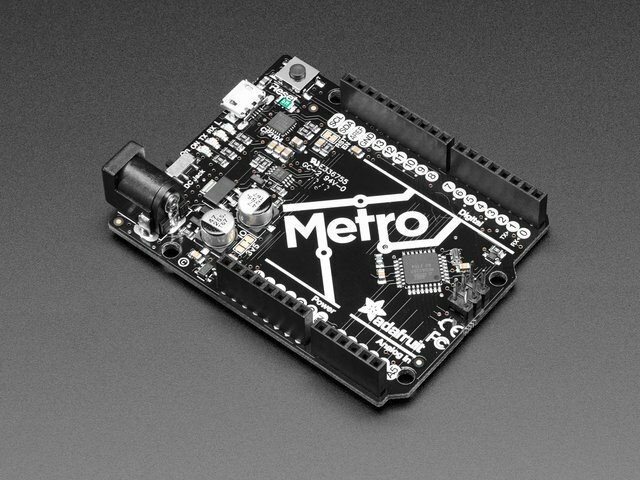 This only works on an UNO and other ATmega328-based Arduinos! The RTC is an i2c device, which means it uses 2 wires to to communicate. These two wires are used to set the time and retrieve it. On the Arduino UNO, these pins are also wired to the Analog 4 and 5 pins. This is a bit annoying since of course we want to have up to 6 analog inputs to read data and now we've lost two. For the RTC library, we'll be using a fork of JeeLab's excellent RTC library. To begin reading and writing to the RTC, you will need to install the Adafruit_RTClib library (code on our github repository). It is available from the Arduino library manager so we recommend using that. And type in RTClib to locate the library. The first thing we'll demonstrate is a test sketch that will read the time from the RTC once a second. We'll also show what happens if you remove the battery and replace it since that causes the RTC to halt. So to start, remove the battery from the holder while the Arduino is not powered or plugged into USB. Wait 3 seconds and then replace the battery. This resets the RTC chip. Now load up the following sketch (which is also found in Examples→RTClib→ds1307) and upload it to your Arduino with the datalogger shield on! This line is very cute, what it does is take the Date and Time according the computer you're using (right when you compile the code) and uses that to program the RTC. If your computer time is not set right you should fix that first. Then you must press the Upload button to compile and then immediately upload. If you compile and then upload later, the clock will be off by that amount of time. Then open up the Serial monitor window to show that the time has been set. From now on, you wont have to ever set the time again: the battery will last 5 or more years. Now that the RTC is merrily ticking away, we'll want to query it for the time. Lets look at the sketch again to see how this is done. There's pretty much only one way to get the time using the RTClib, which is to call now(), a function that returns a DateTime object that describes the year, month, day, hour, minute and second when you callednow(). There are some RTC libraries that instead have you call something like RTC.year() and RTC.hour() to get the current year and hour. However, there's one problem where if you happen to ask for the minute right at3:14:59 just before the next minute rolls over, and then the second right after the minute rolls over (so at3:15:00) you'll see the time as 3:14:00 which is a minute off. If you did it the other way around you could get 3:15:59 - so one minute off in the other direction. Because this is not an especially unlikely occurrence - particularly if you're querying the time pretty often - we take a 'snapshot' of the time from the RTC all at once and then we can pull it apart into day() or second()as seen above. Its a tiny bit more effort but we think its worth it to avoid mistakes! Since there are 60*60*24 = 86400 seconds in a day, we can easily count days since then as well. This might be useful when you want to keep track of how much time has passed since the last query, making some math a lot easier (like checking if its been 5 minutes later, just see if unixtime() has increased by 300, you dont have to worry about hour changes). This guide was first published on Jan 29, 2013. It was last updated on Jan 29, 2013. Repent and temperature-compensate your oscillator, said the tick-tock man!